We will teach you and help feel in control, to make your own descisions about your child and what type of therapy they require. Specifically.... What Can Ots Do? We can help you identify the main concerns associated with your child’s difficulties and educate you on all the options. For example you might need information on which other services (both government and non-government) would be helpful for you and your child. We can help you come up with a plan. A step forward in helping your child build on their skills and be more confident to try activities previously avoided. Require therapy for skill development. Require confidence and self-belief to participate and be involved in learning activities at school. 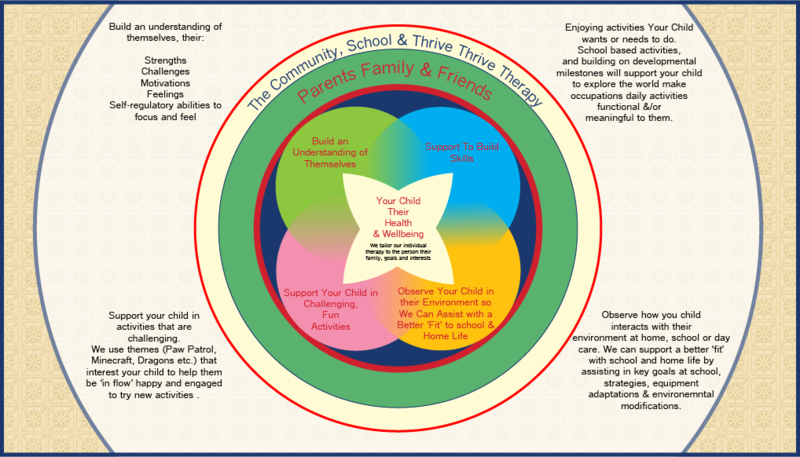 Require support, intervention and strategies to enhance or learn self-care tasks. We provide evidence based, practical help to get them participating more fully in life. Have caring parents who want to help their baby or child be more than happy and content. Your child may have difficulty self-regulating their behaviour and emotions. They may become easily upset or have difficulty calming self when they become overwhelmed by the environment or their worries. Completing performance tasks. They may have challenges in fine motor control, thinking and learning. Completing tasks with lots of steps and modifying the task if the situation changes. Devoting not enough time to the challenge. o Difficulty getting started with an activity such as starting to write a story. Difficulty organising themselves to pack up resources and move from one activity to the next. Difficulty generating planned and organised thoughts to get tasks completed. Provide strategies and recommendations for devices and therapy equipment. Encourage children with communication issues to participate in age appropriate activities and interact with other children their age. Support and assist in implementing strategies for children who have difficulty with aspects of the school day I.e. structured and unstructured (lunch time with peers) times. Work with kids who may be struggling socially and emotionally and consequently affecting home and school life. Improve proficiency in handwriting and participating in activities at school. To improve the child’s ability to sit and complete table top tasks. We can achieve this by monitoring progress, providing advice for environment set up and working on strengthening the body. Improve skills and abilities to participate in activities such as self-care skills (dressing & eating), play, or even bike riding (if appropriate). Practice skills in different ways to assist in meeting their underlying developmental milestones. Practice everyday school based tasks such as story writing, literacy in context of handwriting, using occupational therapy approaches. Family Focused Real Life Therapy.